I'm one of those people that adore stationery and need it to keep my life in order. I also grew up in Japan where having cute little agendas is part of the culture. For the past 3 years, I've been using the Erin Condren Life Planner. You're either a part of the cult following or you're not, simple as that. 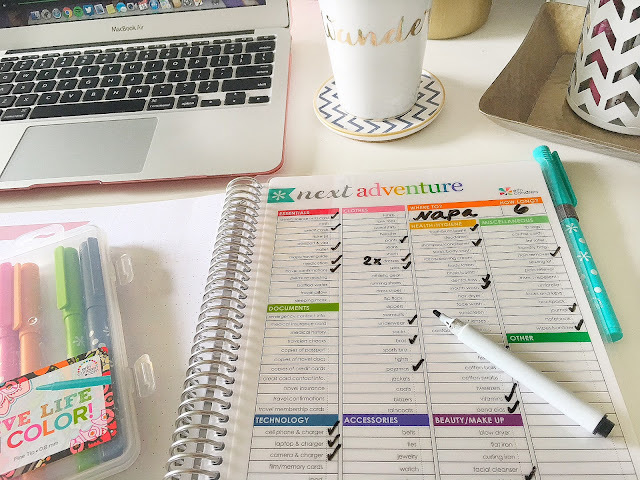 I'm so picky even I surprised myself by using the same planner 3 years in a row! 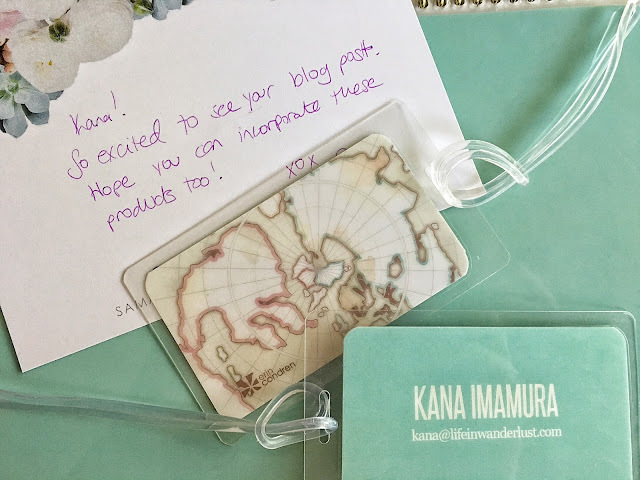 I was beyond thrilled to be asked to review their new Travel Collection. I mean, what?! The company I've loved for years has created a travel collection? I'm in. I'm so in. 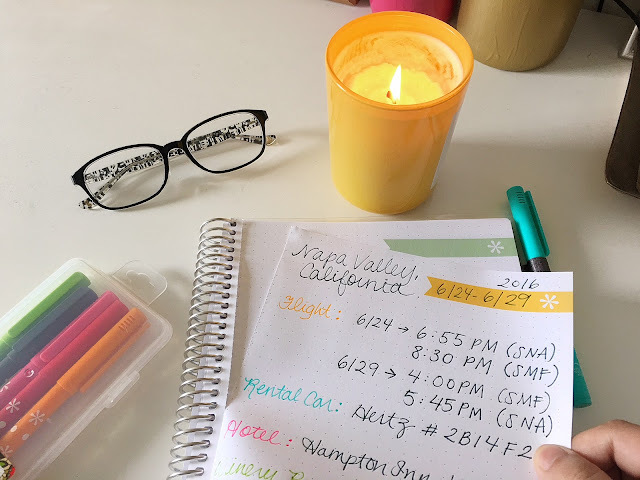 I put the items to use to plan my upcoming trip to Napa Valley! 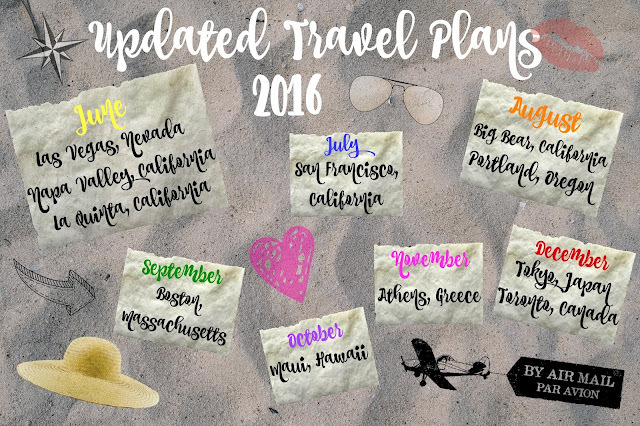 Their Travel Collection consists of several traveler must-haves. 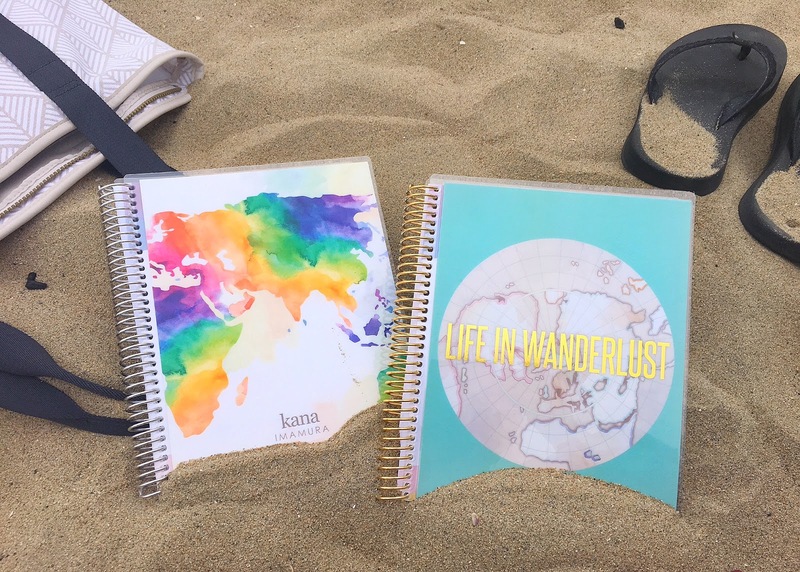 Can we first take a moment to appreciate these personalized Travel Journals below? Obviously I couldn't just pick one so I got both; one with my name and one with my blog name. They turned out cuter than I could have ever imagined! Oh and matching luggage tags? Yes, please! Already interested? I don't blame you! It would make the perfect gift for a traveler or for yourself - treat yo' self sometimes, you know? Click here for $10 off your first order! It doesn't end at cute covers and matching luggage tags, though! 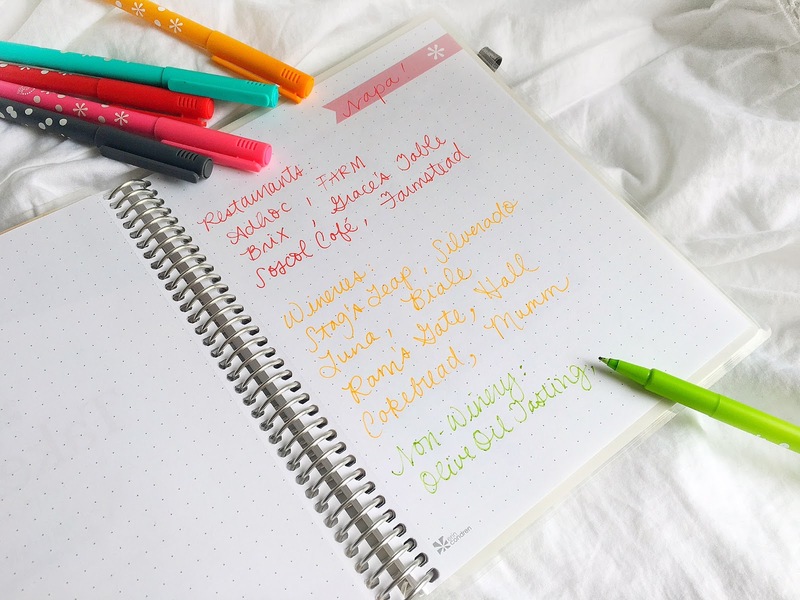 Not only can you personalize the cover, you can also select dotted or lined paper for your journal. I like to doodle and have some freedom when I write so I enjoyed the dotted paper. Love their pens too! They don't bleed through the paper! Another mind-blowing travel-friendly thing? The pages are perforated! When I write down plans like I did for my Napa Valley trip, I like to take it with me. One thing Erin Condren delivers is quality. The cover, the paper, the spiral, they're the highest quality possible for a notebook. I 100% guarantee you'll be pleasantly surprised if you grab one. Last but not least, possibly my favorite accessory in the Travel Collection is the Snap-In Dashboard. Who needs a list app when you have a dry-eraser dashboard to organize with? The front page has a packing list (pictured below) with everything you'll ever need to pack! The back page has a date page (very top picture) where you can write out what you'll be doing during your trip. This way, it makes it easier to pack because it gives you a better picture of what and how much you need to bring! If you're interested in anything (or everything!) from the Erin Condren Travel Line, click here to get $10 off your first order! Just type "Travel" in the search bar and it'll take you straight to the Travel Collection! I also guest posted on Erin Condren's Blog! Click here to check it out! These are all fairly concrete but obviously things can change so we'll see where the rest of the year takes me! Either way, I'm excited to have you follow along! Can you believe 2016 is already half over? Yikes! A huge thank you to Erin Condren (especially Sam!) for sending me these amazing travel goodies and letting me show my readers how much I adore them! These were gifted but my opinions and decision to review items are always my own! I love stationary, I know it's now a world of technology and apps but you can't go past beautiful paper and just having written down in front of you. I think the white board eraser sheet is clever. Very impressive Kana!I love stationery too-colored pens and erasers in particular! I love the iwako brand of erasers from Japan and want to visit their eraser museum when I am in Japan! Oh yes can't believe we are already 6 months into 2016! Your travel plans sound amazing! All the best! Beautiful planners! I am so much into the colors. Looks like the rest of the year is full of exciting adventures. Enjoy! I've never heard of Erin Condren. Very colorful and eye-catching stuff! Thanks for your post - will check them out. Time really flies and plans change - it's good that you can be flexible. Enjoy your travels! Looks like you have some exciting months of travel ahead of you :D That snap-in dashboard looks super cool and I love how colorful your photos are! Thanks for sharing this way cool story on #TheWeeklyPostcard. I am such a notebook geek. It's hard for me to walk by a stationery store without wanting to go in to check out the notebook section. I probably have way too many but I love the idea of having a clean place to put all my thoughts. Erin Condren is new to me. Thanks for the tip - and the $10 off! 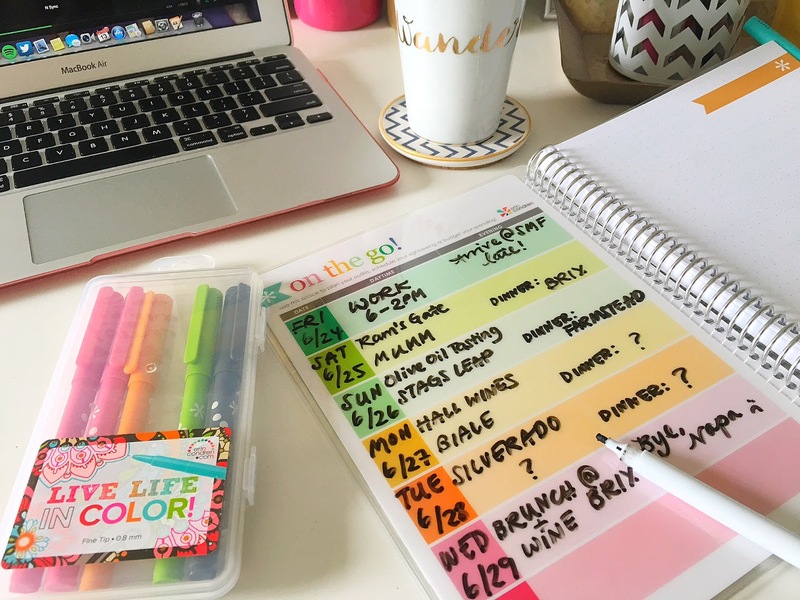 Erin Condren was my go-to planner during Uni! So excited to see they have a travel collection now.